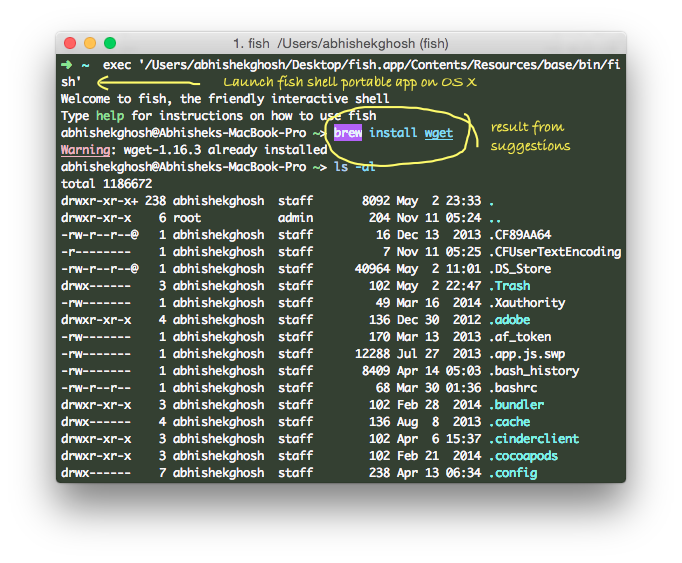 fish Shell is Really a Friendly Interactive Shell Which Be Used on GNU/Linux, OS X or UNIX Systems. fish is a user-friendly and Exotic Shell. Previously we have talked about UNIX Shell, Terminal and Terminal Emulators for providing the basic idea. On OS X, we usually use oh-my-zsh with iTerm2 and Homebrew as package manager. That oh-my-zsh can be replaced with fish Shell or at least can be tested for usability. If you change Debian_8.0 to Debian_7.0 for Deb 7.0. You’ll get abhishek-ghosh as return. fish has good syntax highlighting with error checking feature. Other things are written in the official website. We provided the basic idea. This Article Has Been Shared 3251 Times! Graphics Tablet is a surface with a pointing device for computer input, usually for graphical works.It receives the information on pen pressure and forwards it. Artificial Immune System (AIS) is a class of algorithms used in computational systems with the principles of the immune system of higher class of vertebrates. MongoDB is a high-performance, schema free document oriented open source database is written in C++ programming language. The database is document oriented. Sandbox allows the execution of software(s) with less risk to the operating system. These are often used to execute untested code of dubious origin. To explain the importance of Disaster Recovery it must be emphasized that the events are rare to become impact and it is highly unlikely that impact occurs at incalculable proportions. Cite this article as: Abhishek Ghosh, "fish Shell : The Friendly Interactive Shell," in The Customize Windows, May 2, 2015, April 25, 2019, https://thecustomizewindows.com/2015/05/fish-shell-the-friendly-interactive-shell/.